At high frequencies, a loudspeaker radiates sound directly forwards. At low frequencies, the sound "leaks" around the sides and rear of the enclosure, and becomes omnidirectional. This transition manifests itself as a loss of output on the forward axis at low frequencies, and in an anechoic chamber the loss is 6dB, or a halving of SPL. With a spherical enclosure the transition approximates a gentle first order step, with its centre at a frequency f3 which is related to the baffle dimensions (Olson, 1969), but with most speaker boxes diffraction from the edges of the baffle tends to add wiggles to the response which can be as large as the step. 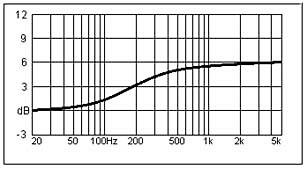 In a system which uses drivers in a modest-sized enclosure, when the drivers themselves are optimised for flat response in a significantly larger baffle, there will therefore be a low frequency loss in the the axial response. Unless compensation is applied for the baffle step, the speakers will sound subjectively thin. The 6dB transition theory assumes that all of the energy that is not radiated into the forward half-space is lost for ever, where common sense tells me that a large part of it will be reflected back from the rear and side walls of a normal listening room. 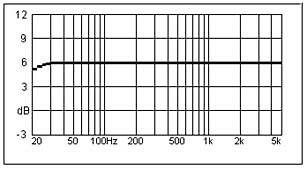 An alternative solution is to compensate for half the subjective low frequency loss, or 3dB. You should use the Zobel correction circuit placed across the driver's input terminals to flatten out any rising impedance. The driver is flushed mounted on a large surface area. Basically these panels have little or no Diffraction Loss above 100Hz. Using calculated values of circuit components, a filter can be constructed and installed between the amp and the driver as shown in the schematic. Now you need to listen and tweak until it is just right for your room, system, and personal taste. I usually perform the following steps to arrive at the final configuration. a) If the bass is still too weak, then the amount of attenuation is too little. The value of Rparallel should be increased until the bass seems to be balanced with the rest of the SPL spectrum. b) If the speaker sounds dull and lifeless, the value of Rparalllel is too high. Reduce the value of Rparallel to bring life back into the music. c) Continue adjusting Rparallel until the speakers sound right to your ears. It is probably best to use acoustic music as a reference during this adjustment period. d) To remove the effect of the baffle step correction circuit completely, substitute a piece of speaker wire for Rparallel. a) Depending on the final value of Rparallel, the original calculated value of LBSC might need to be changed slightly. 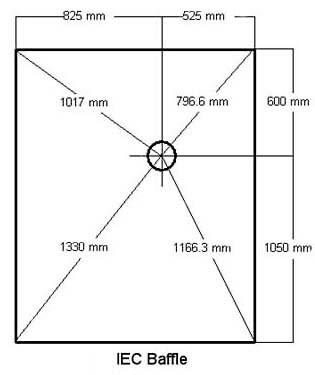 This sets the frequency range over which the baffle step filter attenuates the midrange and high frequencies. If the mid bass sounds depressed, then a lower value of LBSC should be used. I typically perform this adjustment last once I am satisfied with the balance, between the very low bass and the midrange, I have achieved with the resistor. b) Decreasing the value of LBSC will tend to warm the sound of the speaker if the previous value produced a depressed mid bass response. c) Always round down to the next available inductor size, having too low of an inductor value is a lot less problematic then having too large of an inductor value.